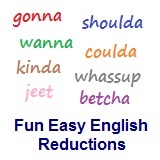 ﻿ Fun Easy English - new-american-english-reductions-reduced-words-topic-word-you-who-did-you-whojya. In this lesson you will learn the American English reduction whojya. Whojya go to the park with today? Who did you go to the park with today? Whojya pick to win the Super Bowl? Whojya think played better in the tennis match today? Whojya meet at the party yesterday? Whojya travel with this past Summer? Whojya say you met last night? Whojya is an American English reduction often used in casual conversations. Reductions, such as whojya are not real words in English.